During our Fall afternoon excursion together, we managed to pick a few Red and Golden Delicious apples at our family orchard. Oh my goodness! They are so good! So, of course, now that I have these glorious apples, I need to do something with them . . . and Apple Fritters are the first on the list. 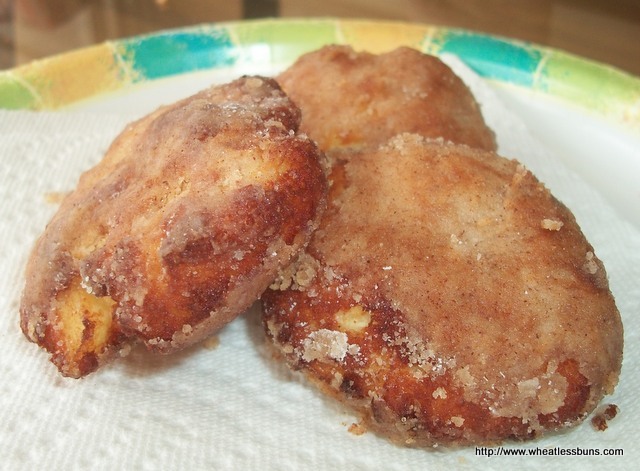 One of my previously posted recipes was "Churros" and those gave me an idea as to how I might create an Apple Fritter recipe that would be both gluten free and low carb. So, the following is what I came up with--and HOLY MOLY! They are delicious!! 1. Heat oil on medium low to low. Heat in a deep pot/sauce pan or fry pan. 3. If the batter seems too runny, add coconut flour in 1 teaspoon increments--allow batter to rest for about 5 minutes before adding anymore coconut flour, if needed. 4. Test the oil by dropping a tiny amount of batter in the oil--it's ready when the batter sizzles and starts to turn brown. 5. Scoop a heaping tablespoon of the batter into your hands then flatten it between the palms of your hands. 7. Allow to cool on a plate covered with paper towels. 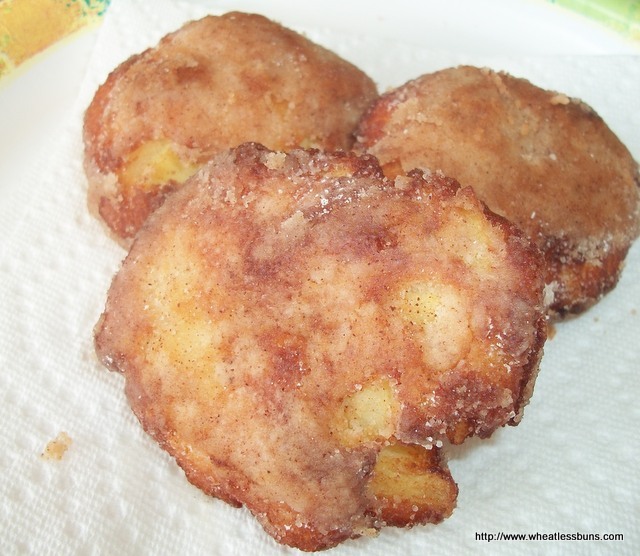 This recipe makes about 4 small or 2 large Apple Fritters. Enjoy! 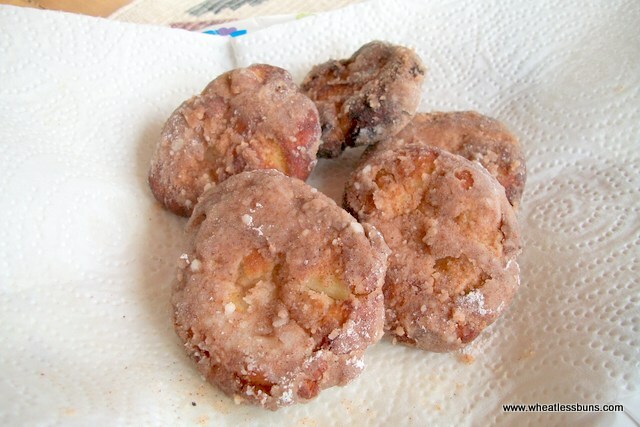 A few of my readers have asked if these Apple Fritters could be made with anything besides Protein Powder. So, I made these by substituting the 1/4 C. Whey Protein Powder with only 1 tsp. of Psyllium Husk Powder. One thing I discovered is the Psyllium Husk Powder cooked faster than with the Protein Powder--hence, the first one turned out overly cooked. As you can see by the Fritter on the back end (see photo below) it's darker than the others. However, after turning the temp. down on the oil and allowing it to cool down slightly, the Fritters turned out lighter and better than the first ones. In terms of taste, I have to admit these Fritters were pretty good and much better than I expected! I hope this answers some of your questions.